When Magic Slim died on February 20th of last year, the blues world lost one of its greatest ambassadors. He was also one of the most prolific, releasing numerous recordings over three and a half decades, including nine albums (plus a greatest hits set) for Blind Pig Records between 1990 and 2012. When Blind Pig released their Blind Pig debut, Gravel Road, in 1990, Slim was backed by one of the most potent editions of the Teardrops, which featured longtime Teardrop (and Slim�s brother) Nick Holt on bass, Mike Scott on drums, and John Primer on second guitar and vocals, with an assist on several tracks from guitarist Steve Freund. Magic Slim fans won�t be disappointed with this outing at all, beginning with rousing versions of some Slim favorites, such as his always-awesome take on Albert King�s �Cold Women With Warm Hearts,� �Mustang Sally,� and �Further On Up The Road.� The band also does a great job on B.B. King�s �Bad Luck Is Falling� and Bo Diddley�s �Before You Accuse Me,� giving both songs the �Teardrop Treatment,� but Slim also brings a couple of tunes of his own to the proceedings, the title track and �Please Don�t Waste My Time� are two of his strongest efforts. As a longtime member of the Teardrops, Primer was always given plenty of room on stage to showcase his own vocal and guitar skills. On Gravel Road, Primer gets three tracks of his own, mostly in a soul/blues vein (Otis Redding�s �Hard To Handle,� Eugene Church�s �Pretty Girls Everywhere,� and Percy Mayfield�s �Prisoner of Love�), and proved once and for all that he was more than capable of carrying the show himself. Sometimes, Gravel Road gets lost in the shuffle of Slim�s impressive run of releases for Blind Pig. Maybe that�s because there was such a gap between this release (1990) and the band�s Blind Pig follow-up, 1996�s Scufflin�, after which Slim released a new disc on the label every couple of years. 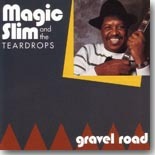 Whatever the reason, blues fans would do good to backtrack and pick up Gravel Road, which shows Magic Slim and the Teardrops at the peak of their powers.